Hey, I like that! 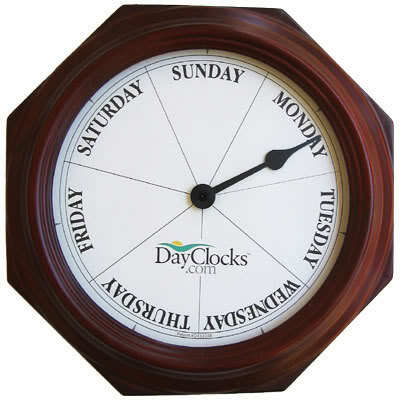 I figure that's the ONLY kind of clock I'll need in a few more weeks! My employer always buys a nice Citizen's watch for the retiree. We really haven't figured out why, because EVERYONE that has retired from the joint laughs at the very thought of that....."What the h*ll do I need a frigging watch for now.....I'm not on a time schedule anymore!" I guess I can sell my retirement watch on eBay and pick up one of those "day" clocks! Even better would be one with six Saturdays and one Sunday. 100% retired and working hard at it. I keep forgetting to wear a watch so I have to stop strangers and ask them the time . My parents need one. They keep forgetting if it is the weekend or not. I am so getting one of those. A few days ago I had to run an errand across town and I was stunned by the traffic I ran into. The words "Don't you people have jobs?" were spoke aloud several times. Then I realized it was Saturday. Those DayClock guys ship pretty quickly. Disclaimer: IRS Rules of Practice require us to inform you that to the extent this written communication, including any attachments, contains a discussion of any federal tax matter, it is not intended or written by us to be used by anyone (i) for the purpose of avoiding federal tax penalties that may be imposed under the Internal Revenue Code or (ii) promoting, marketing or recommending to another party any transaction or matter addressed herein. Should you wish to discuss the implications of this statement or have questions about its meaning, do not hesitate to call our office. Rest assured that this is not intended to reflect a change in the careful and considered manner in which [the company] provides tax advice." I sorta like having no idea what day it is. Love it. I'm always forgetting what day it is. I recently called my bank branch in Florida to inquire about something and was forwarded to their national call center because it was Saturday at 4:30am in the U.S.. I only know what day of the week it is when I get a really fat paper full of ads (its sunday) and when football is on (its either sunday or monday). I also usually have no idea what the date is. I've been off by a week or more, and once thought it was a different month. My insurance agent is thoroughly tickled by the fact that I'm never wearing shoes when I stop by. No no no, it's a trick question-- don't fall for it! I found myself having a conversation with another retiree: "No, I went surfing this morning so I'm almost positive it's Wednesday!" Hey, could be worse. You could have been me, calling the car dealer and trying to get them to fix my car on christmas day. "Hmm...looks like the 25th is open for me..." (long silence) "Sorry sir, but we dont work on christmas..."